In order to track the performance of my mutual funds, I have an email in draft mode where I write down the date I bought in, the number of shares and the NAVPS at that time. I would then check out the current NAVPS over at Sun Life or FAMI and then compute the value of my shares. It’s a very low-tech system but it gets the job done. However, The Thrifty Chick showed me a much better and more efficient way to monitor my funds, through a website aptly named: Monitor My Funds. Monitor My Funds allows you to keep track of the values of mutual funds and UITFs. 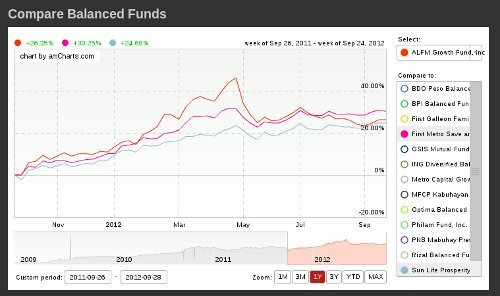 You can see the past performances of funds in graphs. 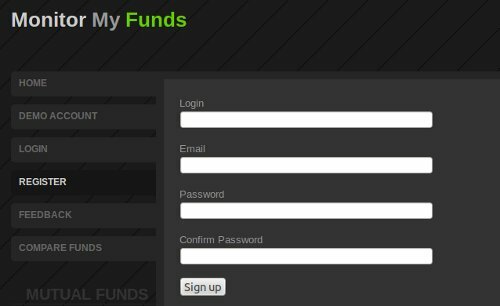 You can create an account and track all your funds in a single page. Check out the demo here. Registration is also easy and takes all of 30 seconds. To start, click the Add Fund to Portfolio link and input the necessary information. I have made several investments in my Sun Life Balanced Fund for the past 2 years and you can see the corresponding gains/loss per investment made as well as the total gains. I’ve only made one investment with First Metro Save and Learn Equity Fund, so that row is basically it. 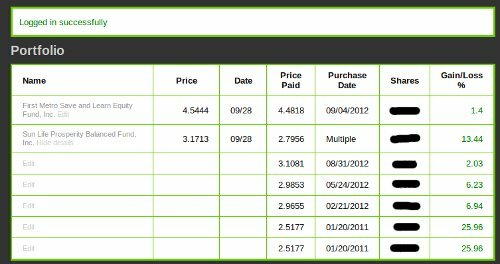 Monitor My Funds also has a compare funds feature so you can see the past performance of the different funds. And that’s that. Nothing like technology to make life a little easier. « One for all and all for one!